I have had a chance to think a bit more about the Major Lazer show. My initial reaction still stands, but I figured I’d try to tease out a little more. I haven’t seen any other reviews of the show yet, so I’ll write this and then go looking. SOB’s was sold out. The crowd was not as painfully hip as I feared it would be. My suspicion is that there are two reasons for this: The “real” hipsters have not yet cottoned on to Major Lazer AND because it is shamelessly populist party/dance music, the “real” hipsters may consider it beneath them. Earplugs installed, we enjoyed the videos of Carnival (in Bahia?) on the big screen for a little while. 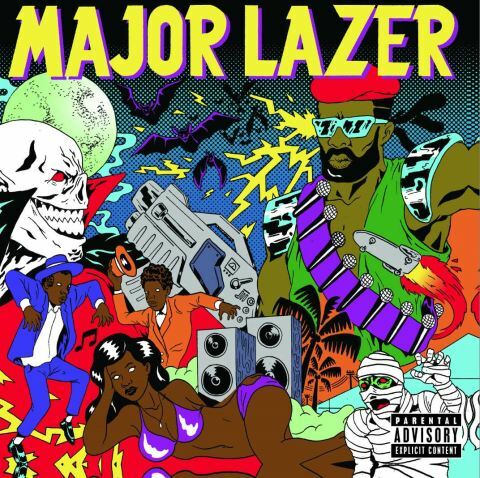 Some very quick background on Major Lazer. He is a veteran of the Zombie Wars of the ’80s and lost a hand during that conflict. It was replaced by a laser and now he goes around fighting evil, the undead and various other villains. He is, of course, not real. Here’s the problem these guys are facing. The strength of the record is also the potential weakness in the live show. Variety. The roots of the project are in Jamaican dancehall, a form which is essentially improvisational. A DJ (or occasionally a band) plays tracks and an MC “toasts” over them. Lyrics change day to day, they are more or less “slack”, depending on mood and character, and the whole set can turn on a dime. But here they are trying to do a live show based on tracks and hooks played from Macs and CDRs and they have to bring up a number of guest artists to “do” the songs they do on the record. This means that the songs are short and the whole set is going to be loose and disjointed. So they cannot be as improvisational as they might like, nor even as they can be during a regular DJ set. But they also can’t be as tight as they might be if they were just playing the tracks, nor even as tight as a good DJ set can be. They are caught betwixt and between. They had an MC and a couple of extremely nubile and occasionally energetic dancers on stage to try and keep the fire going, even this was not enough to overcome the difficulties of flow and dynamics. The best illustration of being caught in no-mans land was in the peaks they tried to develop. There were a couple of times where the beats came together, the BPMs got up towards 130 and the crowd was with them. Most notably on “Pon de Floor”, which has been killing ’em in the underground for a couple of months. Here the crowd got really into it and even the lesbian couple in front of me, who had been liplocked for a good half hour up until then, shook a tail feather. I am happy to say that I did too and for a brief moment we were all transported to that wonderful place of not caring about anything except the bangin’ groove (even with earplugs). But because they felt they had to play the tracks from the record and also get the guests on and off the stage, the groove did not last long enough. The same was less true on the other end of the tempo spectrum. They let off a couple of slow grinders which included some impressive sub-bass growls and relative brevity of these seemed somehow less problematic. My companion did not have quite the stamina I did and so we left a little early. Truth is, I was ready to go too. According to a couple of Twitter posts, they invited the crowd up on stage towards the end, and much of the crown took them up on it. Apparently the bangin’ parts returned. As we drove home I started to wonder if maybe I was being too harsh on Major Lazer. Was the loose and disjointed nature of the show merely a result of it being the first gig on the tour? Could it be that it will tighten up in time? Will the two main guys find a way of working together live which will be less choppy than what we saw? Could a show in the hinterlands, with fewer guests able to make it so easily, be a tighter affair? Or will Diplo and Switch decide that, given the act’s roots in Jamaica, a loosey goosey approach to the live event will be good enough. If you do get a chance to see them on this tour, I really do recommend them. Dates on the Major Lazer MySpace page. As always, bring your earplugs and your disinhibitions. And if you go see ’em, let us know with a review. Be the first to comment on "Live review: #majorlazer at SOB’s June 13 2009 – Qualified Bangin’"